you can't tell how strong she is until you put her in hot water." - Eleanor Roosevelt The 11th of this month is a significant American, indeed World wide originally, date which marked the Armistice of WWI. Since having WWII, and the Korean Action and the Viet Nam Conflict, the date has been reassigned Veteran's Day to commemorate and recognize America's veterans, living and deceased. Your editor grew up during WWII, was ten yrs old on VE Day (Victory over Europe) in a dedicated to Patriotism family. Greatgrandmother Flutie nee Creek Alexander Kendrick's second husband fought in the Spanish American War with Teddy Roosevelt's Rough Riders in 1898. At the age of 44 he signed registration for WWI, but was not called up. When he and Grandmother wed, they prospected in the West and ended up working in the Colorado copper strip mines where he lost one eye to a pick flung loose over his co-worker's shoulder. They then returned to Missouri, where Grandmother carefully guarded against any reference to her infamous relation to the Younger Gang (her father was cousin to the Younger boys), and the two thrived on a farm near Elk River at Pineville. Grandmother, who once confided she slept with a small, all metal ball peen hammer beneath her pillow for protection and had done so since they lived in the rugged Colorado area, outlived her husband Russell, and came to Texas to live with her daughter, our paternal grandmother Nora Viola Alexander Carroll Fisher King. She was very petite, standing just over 5ft, and her hair which she rinsed with black tea was almost as long as her height reaching the floor when let down and she was seated. She enjoyed her life, and even attended your editor's Sophomore Class Party and Dance held in the Carroll home, where she sat smiling and tapping her toe to the music. 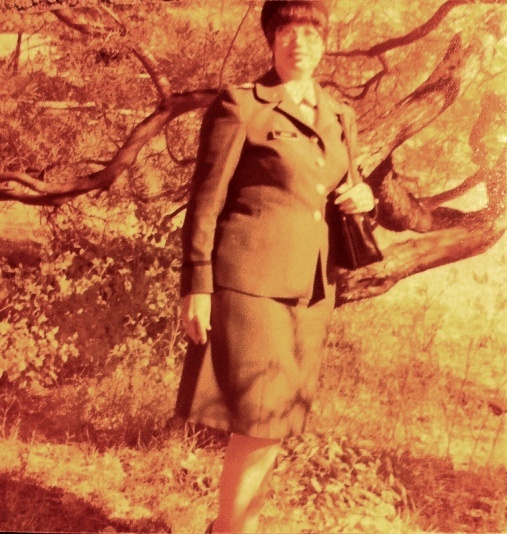 An avid fisher-woman, she and your editor who was only 8 at the time, tracked a neighbor alongside the Pecos River, to find his special fishing hole where he kept catching fish that out-weighed her own catches. She had nodded and whispered "I remember this place." That night at the supper table where said neighbor was guest, she casually described the location, commenting that she had probably 'fished out' that spot a few years back but would likely check it out again soon. He just ducked his head and kept eating. Grandfather Kendrick, who patriotically raised the American Flag every morning, lowered it before sunset each day, planted and tended to a rose bush which carefully pruned and treated with India ink injected in its stem produced a single large blue rose each Memorial Day. He had a vineyard on the side of the mountain that you faced across a small meadow vale when you stood on the east porch, and an apple orchard, cherry trees, gooseberry vines, wild huckleberries, black walnut trees, and even utilized the dandelion and elderberries in his cordials, bounces, and ciders, while Grandmother who had marched with the Suffragettes was a teetotaler. He also grew a few stalks of tobacco in a small lot beside his blacksmith shop, and hung them to dry 'neath its shed roof, bringing one long leaf at a time inside to finish curing behind the wood burning stove in the kitchen, to at length be crumbled, mixed with a drop or two of pure vanilla, and stored in a hand carved humidor, until it found its way to his pipe of an evening. So in his honor, and remembering Uncle Jackie Joslin, AG Adair, Leo Helmer, thanking Uncle Rex Joslin, brother in laws Rod Cohenour and Clyde R. MacGibbon, and recalling Grandmother's half brother Tommy Alexander's sons, and many others, this column is dedicated to veterans and those who did their patriotic duty where and how they could. 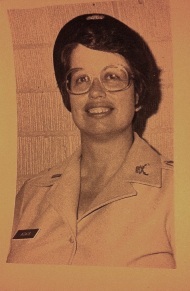 Not in the army, your editor served as enlisted then officer in the Texas State Guard, 403d MP Bn, where AG Adair was first a Company Cdr, then the Battalion Cdr, and was the first, perhaps the only TSG officer to formally retire then be recalled to the Cdr post on the death of that officer. The column pic shows your editor in her summer uniform while the one at the bottom of the page is the dressier winter uniform that she received as a gift from her mother Lena May (Joslin) Carroll. Mother and Daddy both worked in the shipyards at Vancouver, WA., during the war, leasing the family home in west Texas to officers stationed at Pyote Air Base. 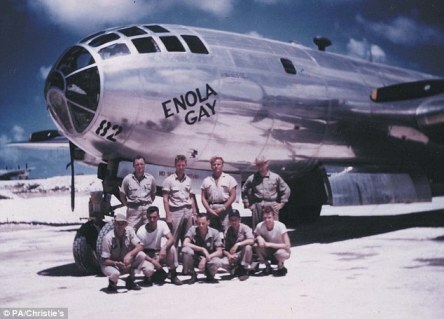 That base, nicknamed Rattlesnake Bomber Base for obvious reasons, is most famous perhaps as the base that the Enola Gay returned to for storage. Later, when the base was downsized to serve as a radar installation, two of the Air Force soldiers deployed there married two of your editor's sisters. Melinda wed Johnny Bradshaw and Jacqui wed Clyde R. MacGibbon. One of this issue's poems is by the late Jacqui MacGibbon aka K'am Treshelle, expressing her delight in her first grandchild, "Suddenly Ashley." Bud Lemire's poems "Where Did The Time Go?" "You Don't See, You Don't Know," and "Don't Live With Regret" show Bud's common sense and wise reminders. Bruce Clifford's poems for October are "Before It's Too Late" and "The Spark." Dayvid Clarkson, offers a poem filled with memories, "Aunt's Piano Player." John I. Blair's poems are "October Rain," "October," "Autumn Arriving," "The Gifts," and "November 1." LC Van Savage in her column "Consider This," remembers the freedom and joys of childhood and playing in "The Sky House." She also has a article "The Saga of The Lowly Napkin" this month. "Introspective" has its author Thomas F. O'Neill in Suchou, China answering queries from readers about family life in China. Dayvid Clarkson writes about personal conceptions, his and ours, in his column "Reflections of the Day." Judith Kroll's column "On Trek" brings forth her feelings about respecting women in "The Woman in the Moon." Mattie Lennon's column "Irish Eyes" gives insight (and sights) on the unique fund raising efforts of Bare To Care Dare to benefit Irish Cancer Society. Rod Cohenour in"Cooking With Rod" tempts the taste buds with Sesame Soy Ginger Chicken. This is one to add to your list of favorites. "Armchair Genealogy" by Melinda Cohenour brings a story of an Indian and Irish lady, Ruth Margaret Muskrat Bronson who became a leader and advocate for Indian rights. No direct family connection as she was the sister-in-law of Uncle Edgar's aunt Elva Mouck Muskrat. Our uncle because our maternal aunt Linnie Jane (Joslin) Burks was married to him. See you in December !! !